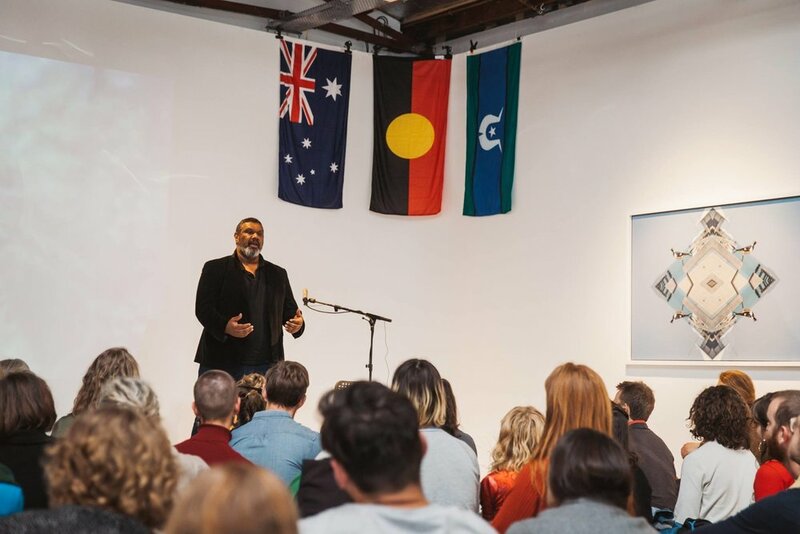 Our's is a story of collaboration through events and workshops with schools, universities, communities, organisations, festivals and individuals, to enact a vision of a more unifed and inclusive Australia. It begins in 2007 at The Armidale School where Warren Roberts had been a student. 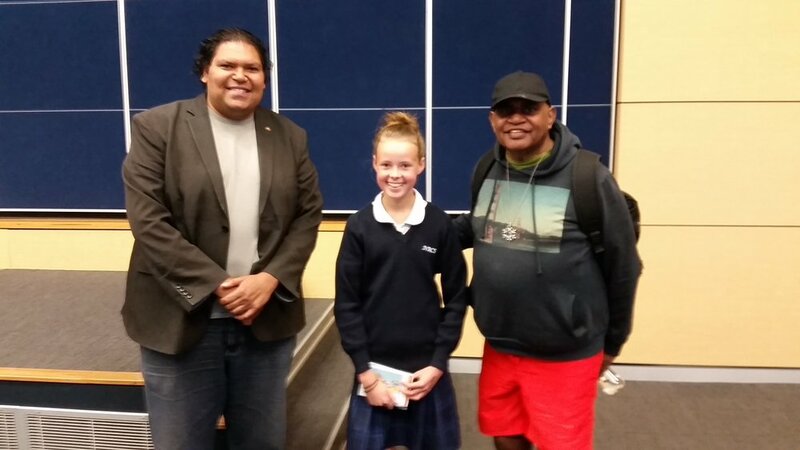 Warren established an Aboriginal Cultural Program at the school providing students with the opportunity to ask questions and learn more about Aboriginal and Torres Strait Islander culture and history. The Program was also discussed at the Presbyterian Ladies College (PLC) in Armidale, as Warren met with their prefects to initiate a conversation there. 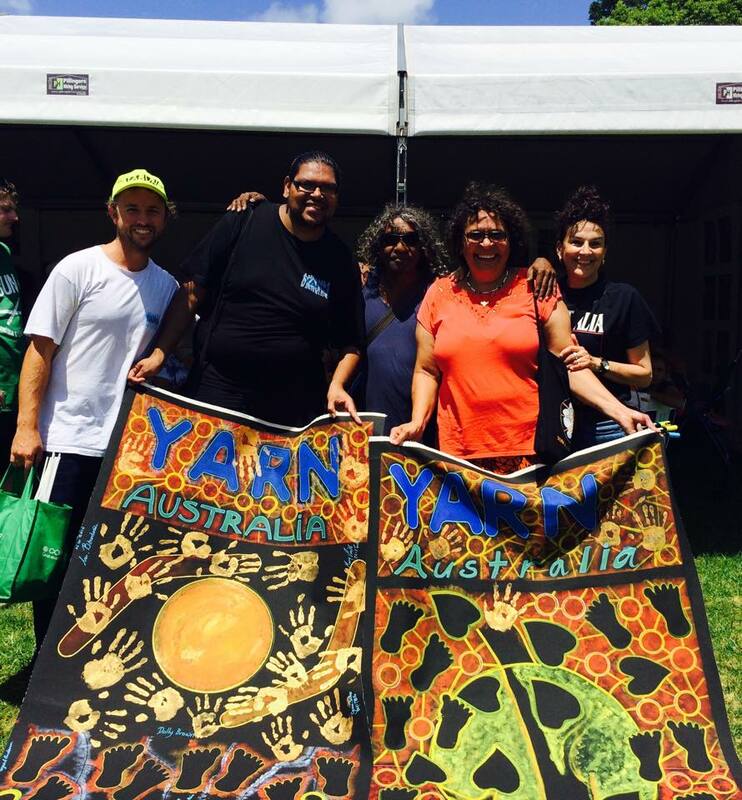 Later that year YARN was officially founded at the University of New South Wales with the goal of uniting Aboriginal and Torres Strait Islander peoples and non-Indigenous Australians through workshops and events held within safe and respectful spaces. Initially these spaces were focused in universities, but they have since expanded throughout the community, and across the continent. 2009 YARN established at the University of La Trobe by Indigenous Student Officer Gordan Franklin. Above a Picture of a poster created for their YARN group on campus. 2010 YARN Founder Warren Roberts led a tour of students and staff from Sydney Universities through the streets of Redfern sharing the stories where he grew up as a child in the 90s. 2011 YARN Founder Warren Roberts was selected to be part of the Young Social Pioneer Program in Melbourne at the Foundations for Young Australians learning with other young social change makers to improve their non-for-profits or business. 2012 YARN Group established at University of Canberra. See above photo of the students and staff who attended one of the first gatherings. 2012 NAIDOC WEEK YARN Launched as a National Program by our first Patron the Former Prime Minister The Hon. Kevin Rudd. YARN Patron Former Prime Minister of Australia The Hon. Kevin Rudd Tweets about the Launch at UNSW. Our first YARN Promo Video was presented to our members and supporters who attended our Website Launch held at UNSW. Thanks Tah Dah Productions for the great video. 2013 YARN 1st National Training Conference held at the National Centre for Indigenous Excellence in Redfern. 2013 YARN 1st Training Conference here is a photo of the participants who attended. 2013 YARN Founder Warren Roberts National Reconciliation Week Guest Speaker at the Department of AusAID in Canberra, ACT. 2013 YARN Founder Warren Roberts Guest Speaker at Department of AusAID in Canberra, ACT. This event was arranged by Zachary Wone. 2013 YARN Hip Hop theme song recorded by Luana Pitt (Mirror Child) and David Cook with music produced by Corey Webster at Sydney’s iconic Koori Radio and then it was formally launched by Brisbane Murri Radio. Above photo of staff and community members who attended the launch. YARN Hip Hop Theme Song Launched on Murri Radio 98.9FM Brisbane produced by artists Singer Luanna Pitt (Mirror Child), Hip Hop Artist David Cook, and Hip Hop artist and Corey Webster (Young Nooky) who produced the music to this track. Click Here to listen to the Interview. 2013 YARN NAIDOC Week Event was a collaboration with Crown Entertainment with a flashmob at the Melbourne Crown in their West End Foyer performed by the Superhoodz Hip Hop Dance Crew who were the semi-finalists in the 2012 show Australia’s Got Talent. 2013 YARN established at the Southern Cross University NAIDOC Event, see above photo of some of their students who attended. 2013 YARN Group established at the Australian National University by Zachary Wone and Jose supported by International students on campus who are in the above photo. 2014 YARN Group at the University of Sydney, set up by Zachary Wone. See above photo of students who attended one of their sessions. 2014 YARN Group at the University of Melbourne, set up by Levi Mckenzie, see above photo of the students who attended one of their sessions. 2014 YARN Group at Australian National University, another photo of students attending of the sessions held there. Thanks to Jose for your hard work. 2014 YARN Group at the University of New South Wales, set up by Anthony O`Rourke, see above photo of the students who attended one of their sessions. 2014 YARN Group at the Southern Cross University, see above students who attended one of their sessions. Thanks Eddie Mercy for your contribution in establishing this program. 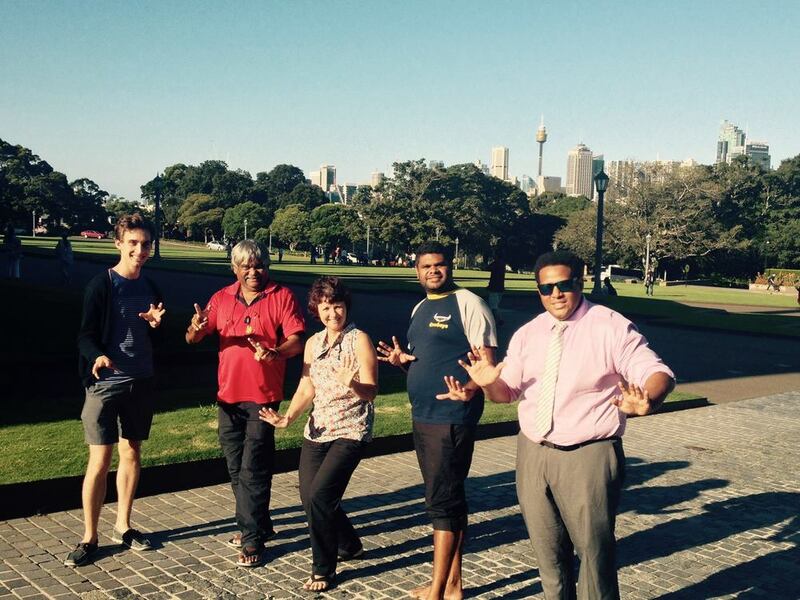 2014 YARN Founder Warren Roberts attended the ICEA Classic in Perth at Cottesloe Beach where he was investigating the potential of collaborating with the Indigenous Communities Education and Awareness (ICEA) Foundation. 2015 YARN Hosts an event at Bondi Beach, see above photo of students who attended. 2015 YARN 3rd National Training Conference held at the University of Sydney. Students attended from Southern Cross University (Gold Coast Campus), University of Queensland, James Cook University, and the University of Sydney. 2015 YARN Launches collaboration with Sixty Thousand as the organisations' Arts, Social Media Platform and Community Events Project. 2015 YARN Formally Launches Sixty Thousand Arts and Social Media Platform, at 107 Projects in Redfern. Sponsored by New South Wales Reconciliation Council. 2015 YARN Sixty Thousand Arts, Social Media Platform, and Community Events Project a major success with of two hundred people in attendance with stories shares by Uncle Ken Canning, Aunty Ali Golding, Poets, and featuring a key note performance by Kahl Wallis from the Medics. 2015 YARN Officially partners with 107 Projects in Redfern hosting another YARN Sixty Thousand event with guest speaker Uncle Graham Moonie sharing his story at the event. 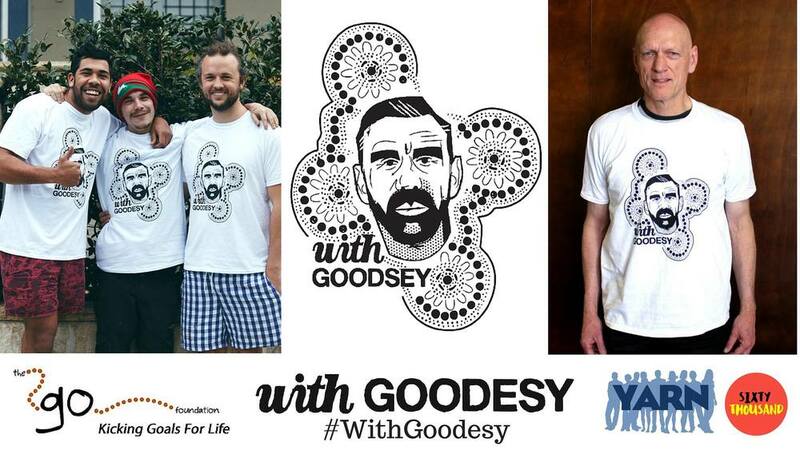 2015 YARN and Sixty Thousand Partnered the 'With Goodesy' Team to show our support for Adam Goodes when it came to pride in the culture of Australia’s First Peoples we were committed to taking a tough stance on racism, as we’re With Goodesy. For further information or how you could purchase a shirt please go to http://www.withgoodesy.com/ all proceeds go to the GO Foundation. 2015 YARN Founder Warren Roberts and Sam Lockwood from the Jezabels having an interview at Koori Radio about the T-Shirts Campaign to Support Adam Goodes. 2015 YARN Sixty Thousand Coordinator from left Tim Pembroke with one of the Artist and Members of the T-Shirt 'With Goodesy' Campaign Team. 2015 YARN Gathering at Crescent Head. See above picture of the many who attended that evening for our story telling and Welcome to Country by local Thunghutti Elders. 2015 YARN Gathering at Crescent Head. Photo of the gathering. Thanks Johnny from Vanlife for the photo. 2015 Over the New Year Eve period YARN headed to run workshops at Lost Paradise Festival on Darkinjung Country (Glenworth Valley) exploring ideas culture, conversation, history and relationship building between cultures. 2016 22nd January SIXTY THOUSAND YEARS EVENT held at the Captain Cook Hotel included a Rooftop YARN, Smoking Ceremony, Aboriginal Elders, Aunties, and young people sharing their stories, Performance by the Green Hand Band, and The Black Turtles both Sydney local Aboriginal bands. Above Photo of the Band members at the front of the Captain Cook Hotel. 2016 22nd January YARN on the Rooftop Aunty Kathy Slater providing a Smoking Ceremony cleansing the Captain Cook Hotel as a new space where we can gather. 2016 January 22nd YARN on the Rooftop of Captain Cook Hotel. See above photo of the many people who attended this gathering. 2016 January 22nd The Green Hand Band Performing at our SIXTY THOUSAND YEARS Event at the Captain Cook Hotel. 2016 January 22nd The Black Turtles Band Performing at our SIXTY THOUSAND YEARS Event at the Captain Cook Hotel. 2016 January 22nd Uncle Graham Mooney sharing some stories about James Cook at our YARN on the Rooftop gathering at the Captain Cook Hotel. 2016 January 22nd Preston Peachey Sharing his story at our YARN on the Rooftop gathering at the Captain Cook Hotel. 2016 January 20th Our Team painting with Aunty Kathryn preparing the Murals for our YARN Story Telling Workshop at YABUN FESTIVAL. Above: Aunty Kathryn Dodd Farawell, Warren Roberts YARN Founder, Patrick Gallego YARN Research Director, Chris Rodrigo YARN Volunteers Coordinator. 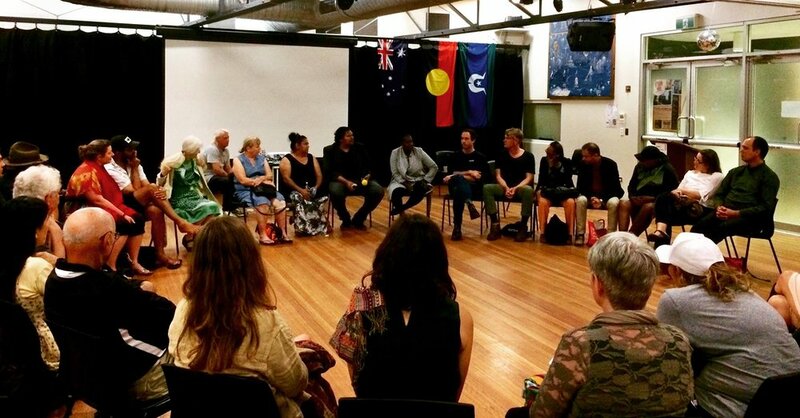 2016 January 26th YARN Story Telling Workshop held at YOUTH STAGE AT THE YABUN FESTIVAL. On Australia Day and Survival Day YARN Collaborates with Aunty Kathryn Dodd Farrawell and the Glebe Tree House through painting a couple of Murals of Art which Elders, Youth, and Jarjums to signed at the Festival. Above Photo: Tim Pembroke Sixty Thousand Years Arts Project Coordinator, Warren Roberts YARN Founder, Bart Willoughby Aboriginal Singer, Aunty Kathryn Dodd Farrawell, and Aunty Wendy from Aunty Wendy's Mob. 2016 March 23rd YARN hosts a Screening of "Black Panther Woman an unflinching documentary describing the Black experience in the volatile period of the 60s and 70s told through the eyes of Marlene Cummins." July 2016 Saturday Night Sixty Thousand Hosts Blackfulla-Whitefulla Aboriginal Bands at the Captain Cook Hotel Celebrating NAIDOC Week. Musicians included Buddy Roberts, the Green Hand Band, the Black Turtles, Didgimatix, Krista Pav & the Social Fabric, Brian Edwards DJ iSight from Wiradjuri Platnum Mixers with Hip Hop by Col Quinlan, and Henry Edwards. 2016 SEPTEMBER - YARN Australia & Vanlife Gathering in Bellbrook at Georges Creek on Thunghutti Country. Enjoyed Stories by Elders, Camping, Exploring, and Swimming. 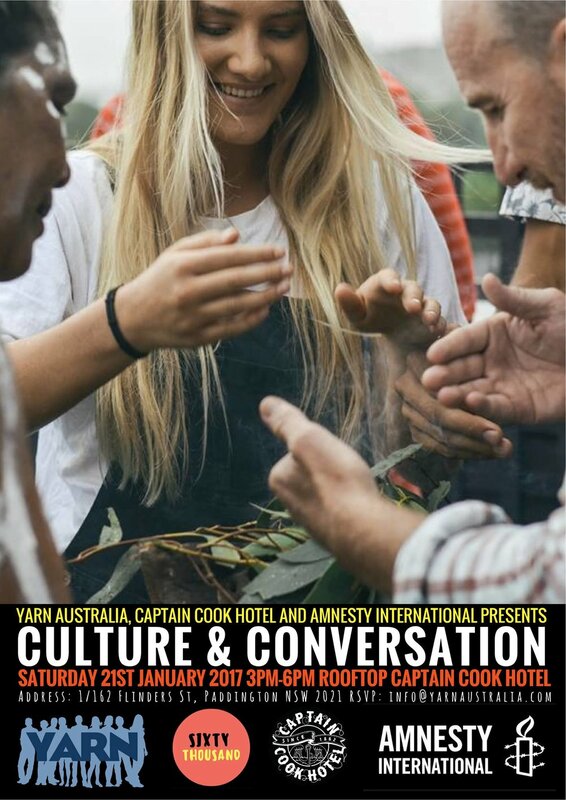 2017 JANUARY 21st YARN Australia Partners with Amnesty International, and Captain Cook Hotel to host Culture & Conversation event. Above Guest Speaker Michael Brogan sharing his story about Culture. Warren Roberts YARN Founder Pictured above. 2017 MARCH 29TH - YARN Australia Partners with Engineers Without Boarders Australia at UNSW. Guest Speaker Aunty Barbara Simms Kealey sharing her story and talking about Caring for Country. 2017 APRIL 4TH YARN Australia Founder Warren Roberts brings Elders Aunty Linda Jackson, Aunty Barbara Simms Kealey, and Uncle Graham Merritt to meet Native American Chief Kuauhtli Vasquez, Ryan Whitewolf, Samart Sky, Jeffrey Slater in Bondi Beach. 2017 AUGUST 25TH Above Photo's are from YARN Australia's Schools Program Culture Workshop at Northern Beaches Christians School (NBCS) attended by YARN CEO & Founder Warren Roberts & YARN Australia Cultural Adviser Uncle Graham Mooney. Organised by NBCS Student Taih Shaw. Thank you also to the Wurundjeri Elders for coming and welcoming us all to this Country. The beginnings of creating a safe space last night at the @yarnaustralia Narrm Melbourne Launch. Thank you to the team, elders and guest speakers for telling their story and contributing to a memorable night of learning, culture & conversation. Thank you also to the Wurundjeri elders for welcoming us all to this Country. Here's the wonderful Maree Clarke speaking on Wednesday night at @yarnaustralia's Narrm (Melbourne) Launch at @merringstudio. Illuminating to hear her story and insights into these powerful works. Thank you to @vivienandersongallery for their support. Thanks to Kent Morris for sharing at @yarnaustralia's Narrm (Melbourne) Launch here at @merringstudio. So interesting to hear him speak about 'cultural representation in the Australian landscape'. Thank you to @vivienandersongallery for their support. Thank you to Katie West for sharing her story and allowing us to screen 'Decolonist' at @yarnaustralia's Narrm (Melbourne) Launch here at @merringstudio. Thank you to the one and only Uncle Jack Charles for sharing his story at the @yarnaustralia Narrm Melbourne Launch last week. What a memorable night of culture & conversation. Thank you also to the Wurundjeri elders for coming and welcoming us all to this Country. Thanks to Renee Sleigh and Kerri Hunt for sharing their story at the @yarnaustralia Narrm Melbourne Launch last week. Such a memorable night of culture & conversation. Thank you also to the Wurundjeri elders for coming and welcoming us all to this Country. The wonderful John Wayne Parsons, a Yugarra and Ugar man, singing and speaking last night at the @yarnaustraliaNarrm Melbourne Launch. 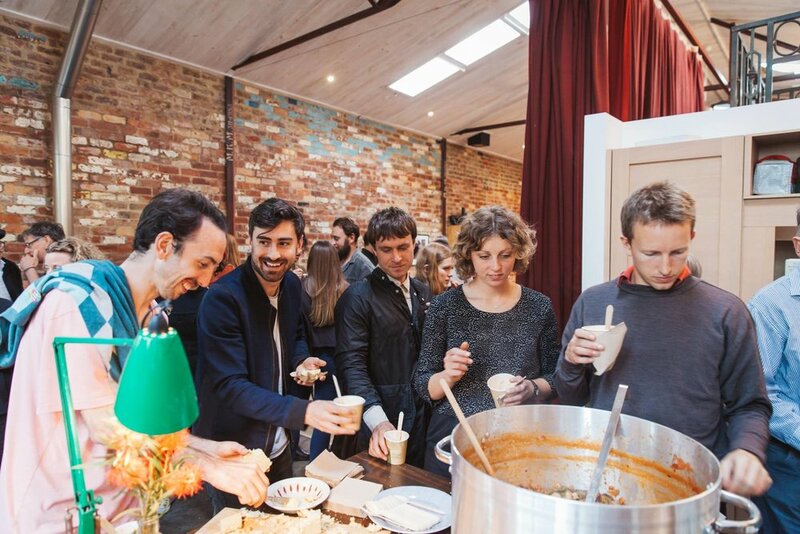 2017 25th October YARN Australia Narrm (Melbourne) Launch of our Community Events in Victoria. 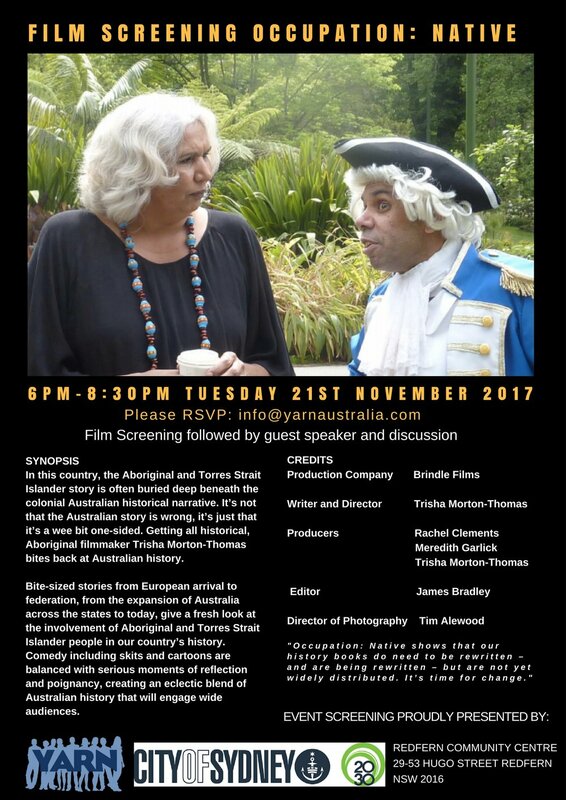 2017 21st November Film Screening Occupation: Native YARN Australia hosted at the event at the Redfern Community Centre. Thanks to Cassie Jackson, and Aunty Lena Quinlin for sharing your stories. See above photo of the many who joined in the YARN Circle and took part in the conversation. 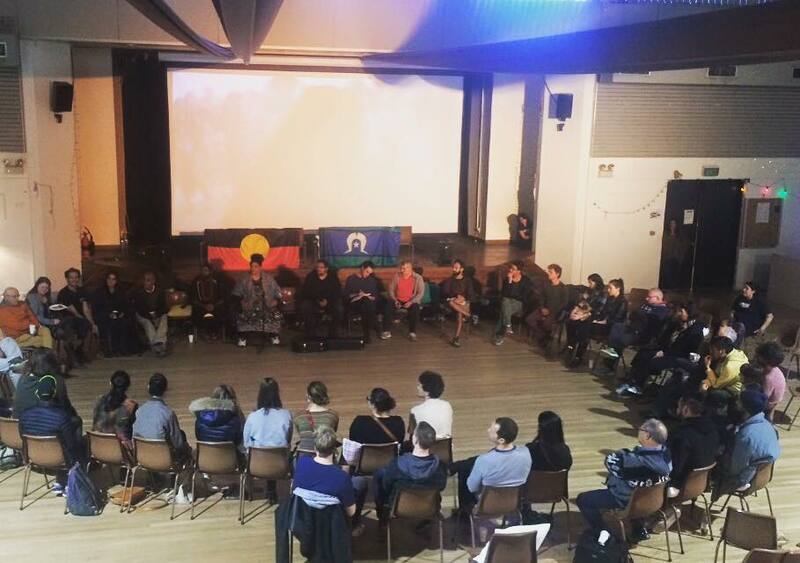 2017 21st November Film Screening Occupation: Native YARN Australia hosted at the event at the Redfern Community Centre. Thanks to Cassie Jackson, and Aunty Lena Quinlin for sharing your stories. See above photo of the many who attended the event. 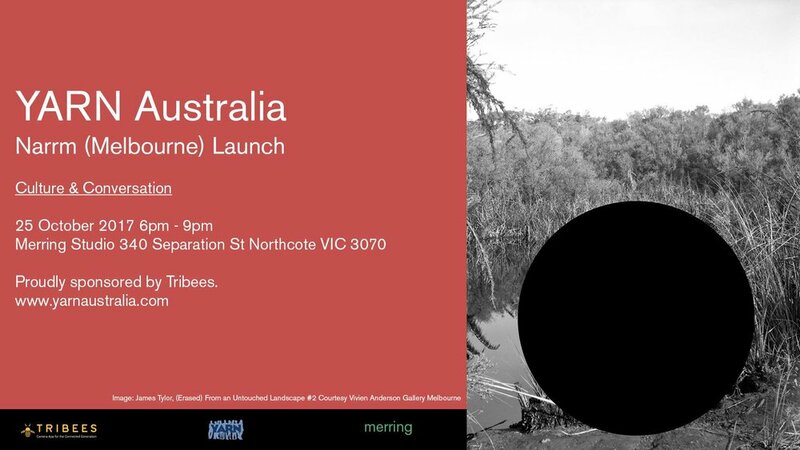 YARN Australia & Merring Studio present a Narrm (Melbourne) Showcase to engage the community in our vision to build connection and unity between Aboriginal and Torres Strait Islander People and Non-Indigenous Australians. Join us for a special evening of conversation, story telling, food, music and an exhibition from local First Nations artists. This will be a safe and respectful space where people can share stories and celebrate their culture. NAIDOC Week 2018 will celebrate the invaluable contributions that Aboriginal and Torres Strait Islander women have made – and continue to make - to our communities, our families, our rich history and our nation. On Wednesday 25th July 2018, YARN Australia will celebrate the stories of the Quinlan Sisters Elva Taylor and Pat Dixon. Elva Taylor was a strong Aboriginal community organiser passionate about community, health and youth development, who advocated for Aboriginal community controlled organisations and to build the capacity of the community to access culturally appropriate services. Pat Dixon was the first Aboriginal woman elected to local government in NSW, holding the positions of Deputy Mayor of Armidale City Council; Aboriginal Policy Officer with the Department of Local Government and Corporate Services; and Member of the Australian Local Government Association. Come along to hear the family and friends of these two sisters share their stories that provide an insight into their passions and what gave them the drive to better the outcomes for Aboriginal and Torres Strait Islander people. 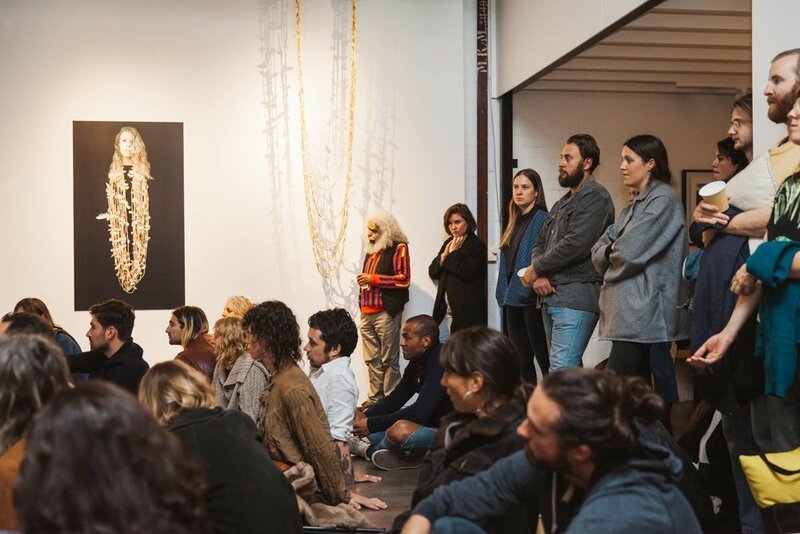 YARN Australia & Merring Studio present a Narrm (Melbourne) Showcase to engage the community in our vision to create connection between Aboriginal and Torres Strait Islander people and non-Indigenous Australians. Jo-Ann Guest Speaker sharing her story about how she got into Cooking Bush Tucker and the intention of her Catering business Goanna Hut.